It's December, and Christmas is upon us. As Santa's semi-truck lurches into town, stores fill with chocolate seasonal items, life feels more abundant -- and my waistline is expanding. The film A Christmas Story, was a humorous slice-of-life that depicted a family preparing for the holidays: a young boy lusting after a beloved toy (that he hoped Santa would bring); the same boy accidentally using the F-word (Ohh, Fudge, he meant); and a riotous scene where a pack of dogs from next door ruin a Thanksgiving turkey feast. 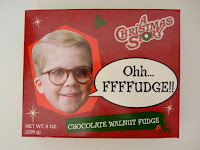 This box of Chocolate Walnut Fudge from McJak Candy Company (Medina, OH - apparently close to where A Christmas Story was filmed), was thematically co-branded with images from the Warner Bros. film. 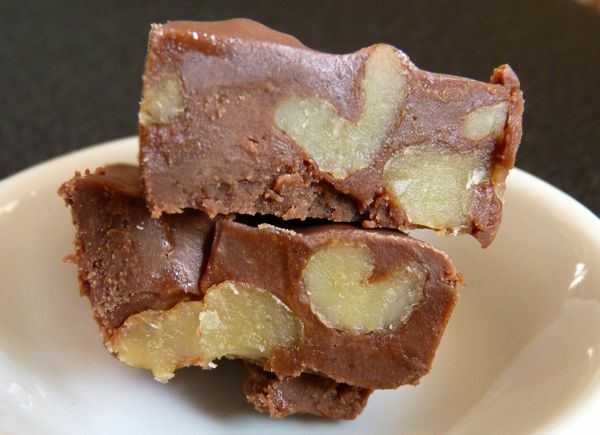 The fudge was good, honest fudge: sweet and smooth, with a healthy does of texture and flavor from embedded walnut pieces. Today was Day #5 of Chocolate and Walnut Theme Week.